We’re now eight years since Spotify’s launch changed music forever. It’s been an eventful ride for Daniel Ek’s business and its ever-growing band of competitors, which now include Apple (Music), Google (Play Music), Microsoft (Groove) and Amazon (Prime Music). But, for Spotify and most services like it, one thing has remained unchanged: a premium service which charges $9.99 a month. There have been some interesting attempts to challenge this model. Rdio, for example, launched a heavily-limited $3.99 per month option in May last year. It went bust six months later. Back in 2013, Bloom.fm arrived on the market – a platform from a London-based startup, which allowed consumers to ‘borrow’ 20 tracks a month for just £1. It went bust a year later. Another UK startup, Psonar, has pioneered a pay-as-you-go model, with users handing over fractional amounts to listen on a song-by-song basis. Last year, it turned to crowdfunding online to raise more cash. As most of the industry recognises, Spotify’s economic model is already challenged by its attempts to secure comprehensive licensing deals (perhaps outside of US mechanical royalties…) from the music biz. In 2014, the company brought in €1.08bn in revenue, but paid out €876.1m as cost of sales – mainly made up of expenditure on music royalties. Clearly, any lessening of Spotify’s current premium pricing structure could have a devastating impact on its business. Try telling that to the consumer. According to Nielsen Music’s annual 360 report, which polls 3,000+ US music fans, the price of Spotify and other services remained a significant barrier to entry for millions of people in 2015. The survey discovered that, despite the fact 75% of music fans listen online in the US each week, and 44% do so on a smartphone, they are very price conscious. Of those who currently use streaming services, 83% said cost was their top reason for choosing a platform. Meanwhile, of those ‘not likely’ to subscribe to Spotify, Apple Music, Google Play or other services, 46% said they were ‘too expensive’. It was the most common answer given when respondents were asked to name the top three obstacles stopping them from subscribing. To a significant degree, the evidence suggests that the music industry needs to listen to these people. For they are many. Another outcome from Nielsen’s 360 Music report was that 78% of all respondents said they were ‘somewhat or very unlikely’ to pay for a streaming service in the next 6 months. Think about the potential scale of that for a second. There are 319m people living in the US – 78% of that number works out at very close to 250m people. And of those people, 46% – 115m, in the US alone – say they won’t pay for streaming simply because it’s too expensive. The second most common reason people non-subscribers said they wouldn’t pay for streaming? 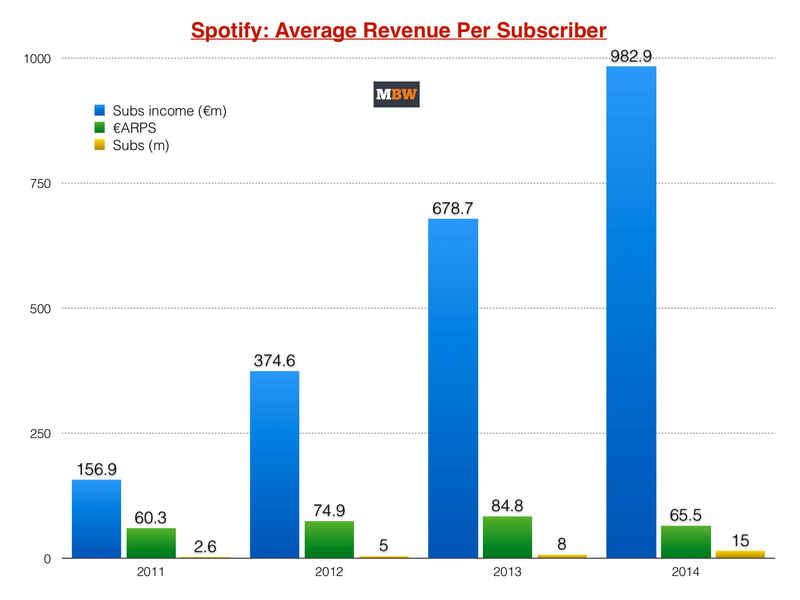 Interestingly, MBW analysis last year discovered that Spotify’s actual average subscription price around the world amongst its active users was significantly lower than $9.99. When mobile bundles, international price variation and promotional cost reductions were all factored in, we estimated, the average Spotify consumer is, in reality, paying €5.45 a month ($5.95) – or €65.50 ($71.30) per year. Maybe someone should tell those 115m non-paying Americans.